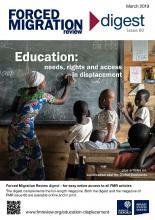 This issue of FMR will be available online and in print in English, Arabic, Spanish and French. Podcasts: The articles are available (in English) in audio/podcast format - see link above under 'Reading and download options'. Please disseminate this issue as widely as possible by circulating to networks, posting links, mentioning it on Twitter and Facebook and adding it to resources lists. 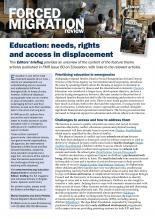 We encourage you to circulate or reproduce any articles in their entirety but please cite: Forced Migration Review issue 60 www.fmreview.org/education-displacement. We are particularly grateful to the following donors for their financial support for this issue: Jesuit Refugee Service, Oxfam IBIS, RET International, Southern New Hampshire University, Swiss Agency for Development and Cooperation and UNHCR/Education Section. All FMR donors are listed at www.fmreview.org/for-donors/donors. FMR has on occasion been included in successful programmatic and research funding bids, to the mutual benefit of all parties. If your organisation is applying (or is part of a consortium applying) for external funding, would you consider including FMR in your proposal narrative and budget, to support the dissemination of learning and results on your particular subject matter – and thereby potentially to boost impact and policy engagement? We would welcome the opportunity to discuss this. Please contact the Editors at fmr@qeh.ox.ac.uk.